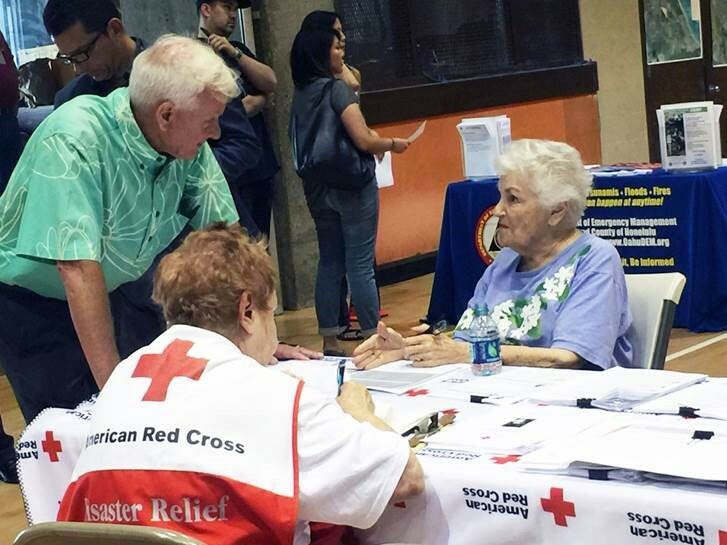 Mayor Caldwell talks story with a local resident at a Disaster Recovery Center at Koko Head District Park (April 24, 2018). Saturday, April 13 marks the one year anniversary of the severe storm that brought localized flooding to East O‘ahu and Windward O‘ahu, causing nearly $20 million in damage to city-owned properties alone. A total of 410 homes suffered damage because of the storm, with 104 homes considered to have suffered major damage, and another 306 homes suffering minor damage. The severe storm shows that all O‘ahu residents need to be prepared in the face of such extreme weather events. The severe weather event on April 13 of last year impacted communities in ‘Āina Haina, Hawai‘i Kai, Maunawili and Waimānalo as the storm spread over the windward slopes of the Ko‘olau Mountain Range, bringing with it dangerous flash flooding conditions. On April 18,, 2018 Mayor Caldwell issued a Proclamation of Emergency for the City and County of Honolulu. The emergency proclamation addressed the impacts to East O‘ahu and Windward O‘ahu residents, property owners and businesses, as well as acknowledging the impact on public facilities and infrastructure. The proclamation began the process to request a Federal Disaster Declaration, which was eventually approved by the White House and made additional disaster assistance and recovery programs available for residents, businesses, non-profit organizations as well as the City and County of Honolulu.